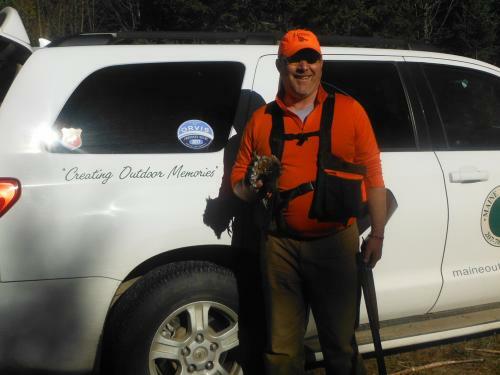 The best grouse hunting story! I know Its time to go fishing but the story is too good! In keeping with my series of great guide stories from my career. This is a grouse hunting story but really more of a, what an amazing individual, story. It is even recent! Keep in mind I have been guiding grouse hunters for over 30 years and have only one other story that is even close to this one. Last October I was hunting with one of the parties I guide each fall at Libby Camps. Brian is a member of one of the party and we always enjoy hunting together a good match of personalities with much laughter even on the slow days. This was to be another is a series of great memories. It was a warm day and we had already enjoyed some good shooting which is different than saying we had a lot of birds to take back to camp, but I digress. Grouse hunting is done mostly along or near the roads for convenience and to provide at least one hunter with the chance of an open shot. Not to say it works as planned but that is the plan. We arrived at our new location; supposedly the last one before lunch on a warm sunny October afternoon. After getting the beeper collar on the dog and setting him to work I positioned my hunters. Brian took the road and his partner in the woods to my right with me and the dog in the middle. We started in an open spot with only raspberry bushes and a lone poplar tree. The dog passed in front of me and stopped on point at that same moment a grouse decided that he did not like the scenario and flushed into the lone tree about 15 feet up. Watching us intently when he landed. We were all wearing hunter orange so I am certain that the bird could see us plainly and of course the dog which was the real reason he had shown himself in the first place. This scenario looked too easy, I called to my hunters telling Brian to stay where he was and bringing the second gun up to my side. Brian while he was standing in the road was positioned in a small opening in the row of firs that grows along most roads in the woods near camp. The opening was maybe five feet wide. His partner was in the complete open and moving up quickly. This all proved too much for the nervous bird who took to wing. For a second I thought oh good someone is sure to get a shot at this one. I was wrong. The bird flew directly at Brian meaning his only shot was directly at me and his partner. Of course the second hunter had only a shot at Brian. No shot for the moment. Brian was my only hope for a quick shot as the bird flew through the opening and across the road. I waited, and waited. Maybe a minute went by but no shot. Surprised I called to Brian “what was wrong with that one?” To my request came the calm and quiet reply “come over here and fetch up the dead bird”. Not understanding I remarked about how it was an impossible shot or some such foolishness. Again he calmly said come fetch up the dead bird. I walked over to humor him and sure enough there was our quarry in the ditch on the further side of the road very dead. I’m sure the puzzled look on my face required an explanation and Brian quickly made clear exactly what had happened. As the bird flew toward him there was no shot to be taken and the bird flew right through the narrow opening in the firs at about waist height with Brain right in the middle. So instead of shouldering his gun he simply stood like he was going to bunt a baseball and hit the bird with the barrel of his gun resulting in the dead bird I now held in my hand. Amazing is all I can say over 30 years I am sure that I have hunted with thousands of hunters and seen tens of thousands of flushes. This is the only time when this result could have happened and Brian was right there to execute perfectly! Needless to say not one other hunter holds a candle to his level so poise of skill with the barrel of a shotgun! Not sure how we can top that but we will try again this October!